From the moment it was announced that Phase Three of the Marvel Cinematic Universe would culminate with Avengers: Infinity War, there’s been speculation that the two-part movie will see Earth’s Mightiest Heroes teaming up with the Guardians of the Galaxy to battle the Mad Titan Thanos. 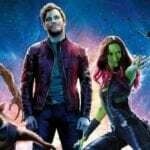 So far, Marvel has refused to be drawn into the speculation, but Captain America: Civil War and Infinity War co-director Anthony Russo has now seemingly confirmed the Guardians’ involvement – or Chris Pratt’s Star-Lord, at the very least. Avengers: Infinity War – Part I is set for release on May 2nd 2018, followed by Avengers: Infinity War – Part II on May 3rd, 2019.